We’ve been growing chard for a couple years now, and fortunately our chard comes back each spring. The baby leaves are as tender as any salad bowl lettuce and full of flavor, and it’s so satisfying to see the chard sprout, then pick the small, tender leaves and have them on the table in just a few minutes. I really love that benefit of growing my own. 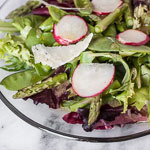 I like to pair baby chard with other robust flavors, and the flavor combination in this salad makes it one of my very favorites. 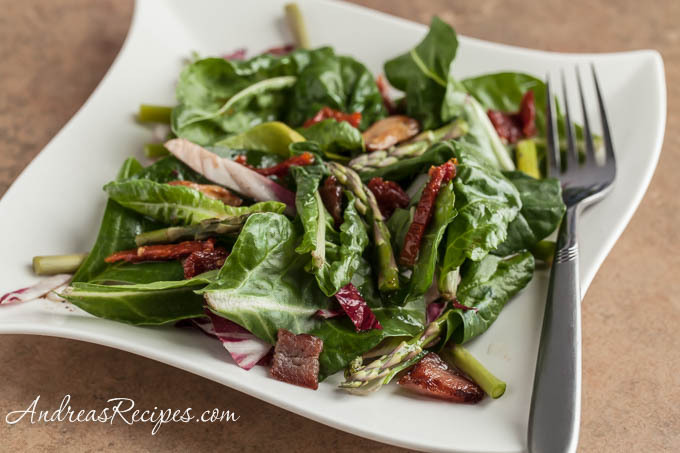 The classic hot bacon dressing goes so well with fresh baby chard, especially when it’s updated with white balsamic vinegar and roasted garlic. That’s my kind of salad. In the skillet over medium heat, cook the bacon pieces until slightly crispy and the fat is rendered. Remove the bacon and drain on a paper towel. Reduce the heat to medium low. In the small bowl, stir the balsamic vinegar and sugar together until the sugar dissolves. Add the mixture to the skillet and stir until it warms. Add the roasted garlic cloves and cook at a simmer for 3 to 4 minutes. Season with the black pepper. 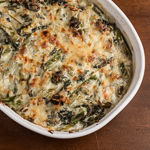 Arrange the chard leaves among 4 plates, add some radicchio and divide the asparagus spears among the plates. Top each plate with sun-dried tomato slices and roasted garlic cloves, then drizzle the bacon vinaigrette on top. Serve immediately. I never thought of using baby chard in a salad, but what a great idea. I can’t imagine life without chard! It is so delicious in so many recipes. To me, it’s interchangeable with spinach and I love that it’s a perennial! I love to stuff the leaves like grape leaves, too. Yay! Spring is here and all the goodies that go with it! Come visit when you can. A wonderful & good for you sald! And who doesn’t love the good old bacon? Yum! 🙂 Lovely food! 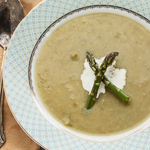 Thanks for tip – added to twitter and pinterest to inspire asparagus recipes;)).